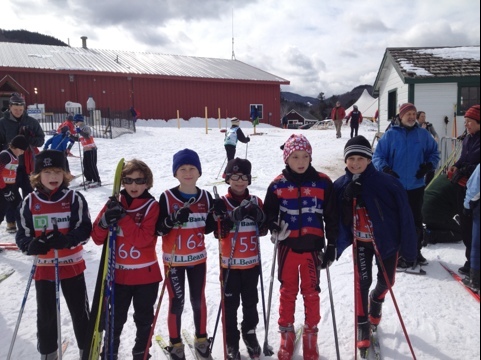 Back in March, we took our kids up to the Bill Koch Festival. (Bill Koch was the first North American to win an Olympic medal in nordic skiing.) The Festival is a 2-day event that combines fun and games with some pretty serious competitions. Since November, beginning first with dryland and then moving onto snow, we had been practicing technique and doing fun drills, sprints and relays. There are two things we want kids to get out of the Bill Koch experience: 1) have fun and 2) learn how to ski. Anything beyond that is a bonus. At the Festival, I was the coach for the grade 3-4 boys from the Eastern Mass Bill Koch League. As coaches, we try to make sure the kids are prepared for the competition, to teach those who want to compete how to do it. The emphasis is on attitude and preparation, rather than on the results. That said, it’s worth noting that many alums from EMBK have gone on to race with the Cambridge Sports Union (CSU) and win national championships. For the Festival, we pull-out all the stops to take care of the kids. There’s a food table and a wax tent. There are course tours. Strategies are discussed. The skis are prepped with high fluoro wax, rills and top-coats — fast skis are critical to having fun. The kids take it seriously, too…maybe too seriously at times. This year, the awards ceremonies left some of the kids feeling low. All the competitors were called to gather for the awards, then awards were given to the top 10 or 20. For the kids who finished 11th or 21st, it was a rough experience. Sometimes, when the results are less than desired or expected, it kills the spirit. Other times, it sparks the fire.